At Grice Chiropractic, we utilize the latest technologies, as well as traditional chiropractic techniques, to ensure you receive the best care possible. On this page, you can read more about some of our treatment techniques. We offer a wide range of equipment to help improve strength, flexibility, range of movement, and balance, uniquely tailored to your personal needs. Also known as electromyostimulation, or “stim” for short, this service causes muscular contraction by mimicking firing signals that come from the central nervous system. Stim can be used in both recovery from injury as well as to help improve muscular endurance. Those with persistent back pain may benefit from spinal decompression. This treatment gently stretches the spinal to relieve pressure on the vertebrae and the nerves within. Cold laser therapy is a non-invasive, painless procedure that users low level lasers to alter cellular function, effectively encouraging them to increase their function. The Proadjuster uses precise measurements to analyze, adjust, and reanalyze the spine. This equipment relieves pressure off of the nerves by using microadjustments on a specific vertebrae that has been determined to be out of alignment. Pain can be, excruciating, annoying, disruptive, unsettling, relentless, consuming. It is not fun! However, could you imagine smoke detectors without noisy alarms? They would be pretty useless and many buildings would subsequently burn to the ground. Pain nerves are your body's Smoke Alarm system. They alert us to problems that need your attention. Like taking your hand off the hot stove, a nerve is being pinched, a bone is broken, there's a splinter in your finger to name but a few. It is how you deal with pain that is the REAL problem. Opioid addiction is out of control and many good people and their families' are profoundly affected. Many are seeking professional advice or care and end up addicted. Their lives are ruined and all they wanted was relief from pain. There are many alternative NATURAL treatments that are available. Primarily there has been Chiropractic Care and Nutritional supplementation. 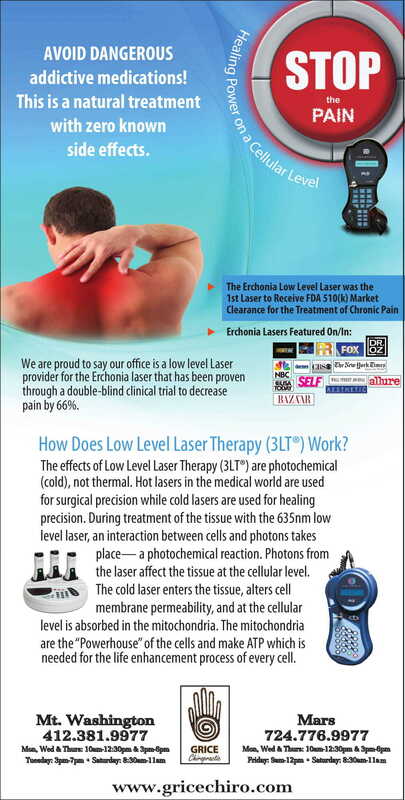 Now there is Low Level Laser Therapy. 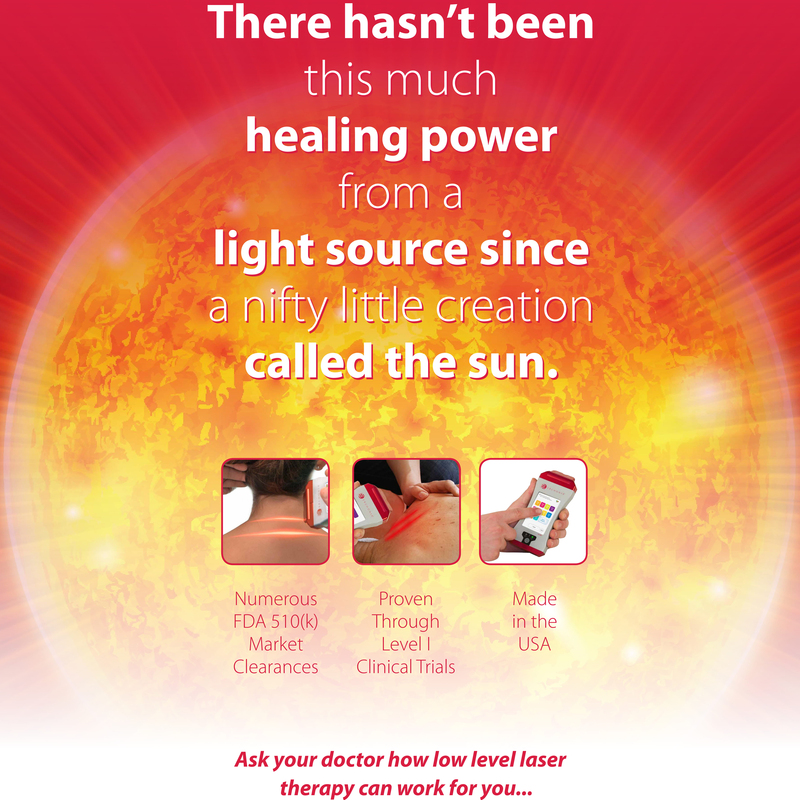 Low level laser has ZERO known side effects and has helped acute and VERY CHRONIC pain. It is gaining in popularity and becoming more readily available across the nation. Lasers emitting a 635NM beam are proving to be most effective.